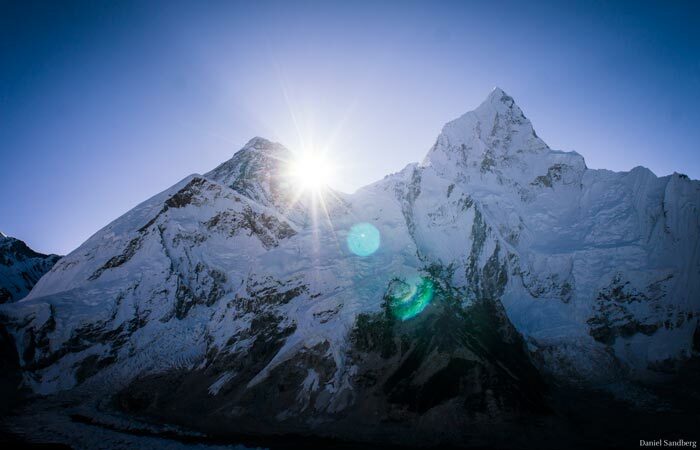 The image that many people have of Mount Everest is that of dazzling white snow, endless mountainous landscape and an unparalleled natural beauty. But as soon as you get close up with this majestic natural environment it starts to look less beautiful. Ever since the first expeditions nearly 100 years ago, adventurers have left tons of rubbish on the mountain. Every year tens of thousands of tourists flock to Sagarmatha National Park at the foot of Mount Everest. From mid-March to late May hundreds of climbers tries to reach the summit. This has resulted in tons of rubbish threatening to scare away both climbers and tourists. Also, the climate changes have resulted in melting snow and ice, which reveals old rubbish that has been hidden for decades. These are the reasons as to why the extensive work to clean up the mountain from thousands of oxygen tanks, tents, climbing gear, gas cylinders, packaging and other waste started. Primus is engaged in the work and is also financially supporting the project. The Nepalese authorities have realized that the country's main tourist attractions and main source of income was threatened. 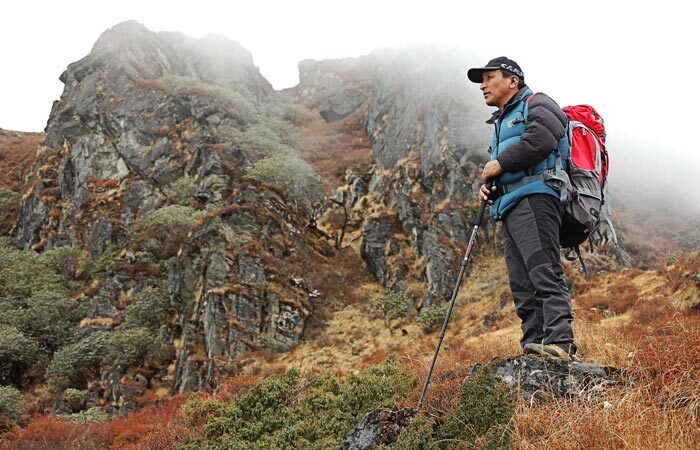 Wongshu Sherpa, who has worked in the area and has experienced the debris-threat throughout his life, is one of the initiators of Saving Mount Everest. An extensive cleaning project where the government, trekking organizations and businesses are working together. In the spring of 2011 the largest clean-up ever of the mountain started. 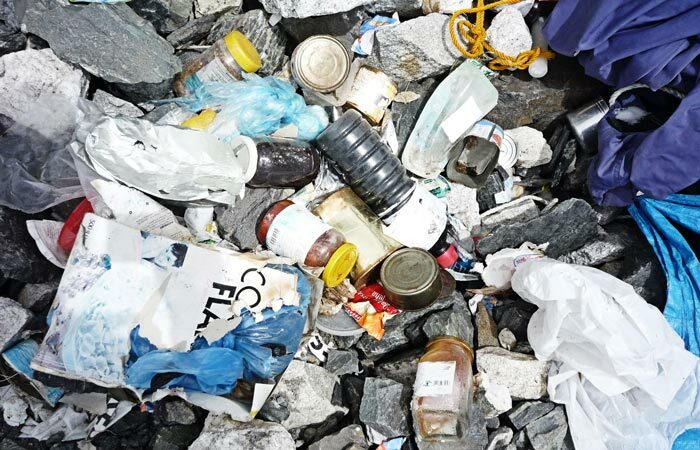 The high altitude, the inaccessibility and the thin air makes it impossible to carry down the debris with helicopter for example, thus hundreds of Sherpa's collects and hauls down a total of eight to ten tons of rubbish from the 8500 meter level down to the base camp at 5450 meters. Here, the waste is sorted and disposed of. Parallel with this cleaning operation there are plans for a number of waste and recycling stations along the hiking trails to Mount Everest Base Camp. The goal is to create a complete waste station and further train local people so that they will be able to recycle biodegradable and recyclable waste products. Metals, plastics and more complex waste will be sent to Kathmandu where it can be sold. In phase two, Nepal's schools will begin to educate students in waste separation to create a long-term development. The goal is to have the climbing community on Mount Everest and all the tourism in the region managed by local people in an environmentally and economically sustainable way. In 1953 Mount Everest was concurred for the first time ever by the New Zealander Sir Edmund Hillary and the Nepalese Tenzing Norgay. Between then and 1990, 300 people reached the summit. In 1990 Mikael Reuterswärd and Oskar Kihlborg were the first Swedes on the top. In 1996 Göran Kropp ascended the mountain without oxygen, after first having cycled to the foot of the mountain from Sweden and moreover brought all the packing himself. Renata Chlumska became the first Swedish woman to climb Mount Everest in 1999. 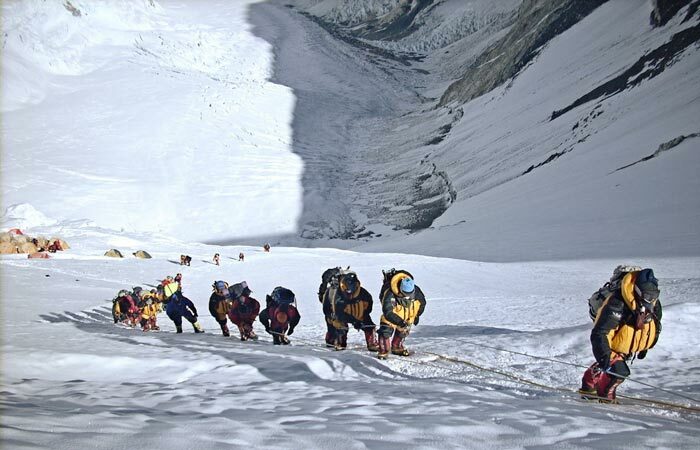 In the last 20 years, about 4000 people have reached the top of Mount Everest and it is saddening to see all the waste the expeditions has left behind. Nepal is one of the poorest countries in the world and tourism is the single most important source of income for the country's mountain population. Therefore it is important to find a sustainable system for dealing with the problem of littering.There is a trend of more climbers every year and for each person to get up at the top it requires a comprehensive organization of personnel and equipment. The increased amount of tourists to Mount Everest and the Sagarmatha National Park threatens to leave a landfill after them, says Tommy Gustafsson, Swedish initiator and supporter of the project. Along with Tommy Gustafsson, Wongshu Sherpa and all others who work actively in the project Primus want to demonstrate its commitment and support to Nepal so that the country also in the future can remain an attractive destination for adventurers and nature lovers. Read more at Saving Mount Everest website. Mount Everest is the world's highest mountain and is situated on the border between Nepal and China in the Himalayas. The mountain's Nepali name is Sagarmatha and the top of the mountain reaches 8848 m above sea level. Mount Everest was climbed for the first time on May 29, 1953 by Sir Edmund Hillary and Tenzing Norgay. Most people who visits the Nepalese side of Everest flies to the mountain village of Lukla and start their trek to Everest base camp from there. Getting to the base camp takes about 8-10 days from Lukla and is a perfectly reasonable goal for fit hikers. The base camp is situated 5379 m above sea level and between there and the top it is another four camps. The mountain has two main routes, the southeast and northeast side, and most ascents are made in May, before the monsoon season starts. In peak season, about thousand people are staying at the base camp, where also the highest hospital in the world is located. If you want to climb Mount Everest it is necessary to have a permit. It costs 50 000 USD for seven climbers. In addition there will be equipment, Sherpa guides and other supplies. In the end, the cost of an expedition will land at around 40,000 to 60,000 USD per person, and requires careful planning months in advance. 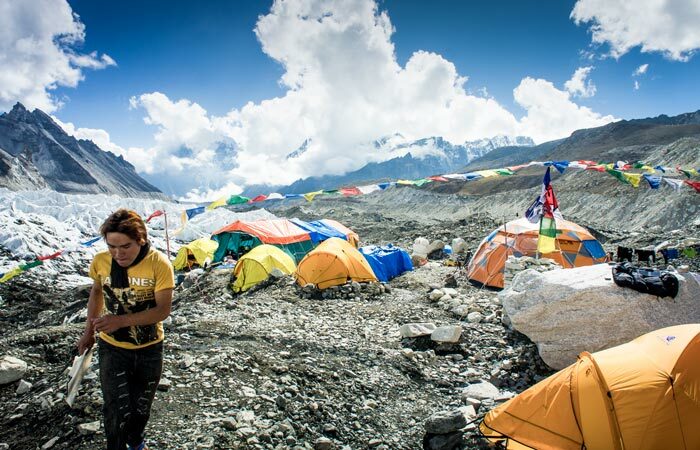 Getting to the peak from the base camp is very demanding and it takes several weeks to acclimatise. For the body to get used to the altitude you have to climb to the next camp (Camp 1) and spend one or two nights there then descend to a lower altitude again. After a few days the same procedure will be done climbing up to the next camp (camp 2) and so on. So far, around 3000 people have completed nearly 5000 ascents. The youngest person that has ever climbed Mount Everest is the American Jordan Romero, who was 13 when he ascended the mountain on May 22, 2010. The eldest who ascended the mountain is the Nepalese Min Bahadur Sherchan, who was 77 years old when he reached the summit on May 25, 2008. First woman to climb Everest was the Japanese, Junko Tabei, who ascended the mountain on May 16, 1975.